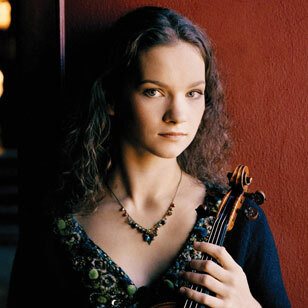 When violinist Hilary Hahn’s publicist approached me to tell me of her latest project, I was thrilled. For years, I’d been in awe of the young musician’s virtuosity and impassioned performances. Better still, her new record, Charles Ives: Four Sonatas features Hahn playing–surprise–work by classic Americana composer Charles Ives. And play them she does, using her trademark nuanced flair to spin the pieces into sonic gold. She also has another treat in the works, entitled Encore, which features a contest to compose one of the pieces. Even if you’re not often interested in classical music, I highly recommend checking out this interview and the music. ELM: Is Ives a composer that has influenced you for a long time? HH: He is a composer who has influenced composers for a long time, so in that sense, I am sure that I have worked on elements of his music for longer than I have actually played his music. I learned a lot from these sonatas that I have applied to other pieces since. ELM: What piece was the hardest to get down, and why? HH: Of the Ives, definitely the Third Sonata. That was the first one we worked on, and it was brand new territory! Once you have played something by a certain composer, you have an idea of how to approach the next piece by that same composer, but the first time around, you have to tiptoe around the wall it puts up, knocking on all the doors until you find one that gives way to further exploration. I was taken by surprise by the Third. It was much more complicated to put together than I expected; when I had heard it previously, I had focused on the flow of the music and not given much thought to how the details lined up. It carried me on as a listener, as a great piece of music should. When we began to play that piece, though, we almost had to dissect it in order to assemble it. The way Ives uses rhythm was new to me, as were many of his innovative structural concepts. Eventually, we got the piece onstage, and it revealed itself further. It gives the performers a lot of room for interpretation, and that is liberating. We could experiment with details as well as the big picture in many different directions in the course of a tour. We didn’t get tired of it at all. So we decided to learn the other three in the set, and we found those equally rewarding to work on. Each has its own distinct character. ELM: Lately I’ve been listening to another Deutsche Grammophon release, Tori Amos’ “Night of Hunters.” On this album, she takes melodies from all sorts of composers and transforms them into full songs with lyrics and her own interpretation of the source material. Minus perhaps the vocals, could you see yourself doing something that takes that many liberties with reinterpreting a piece? HH: You’re right, no vocals for me! I am not sure how I would do such a project. I feel like there is so much variety within the somewhat abstract yet very present world of interpretation. Musical notation is relative: there are no real absolutes. As long as the proportions of note length, loudness, and intonation basically reference what is on the page, everything else is up to the performer. The possibilities are endless. ELM: On that subject, how do you feel like you reinterpreted Ives? What did you add to the mythos of his work? HH: With Ives, there are not enough traditions of interpretation yet — since not so many people play his music live and the printed music, rather than teachers, has been the definitive performance source for generations — to represent a groundwork for reinterpretation. It is still direct interpretation from the score to the stage. I just tried to look to what he wrote for guidance, and I did some followup background research as I grew comfortable with playing this music. ELM: Tell me more about Encore, your new project of commissioning 26 composers to write short, encore-style pieces. Where did you get the idea to do this? What composers are represented? What styles does the music span? HH: Almost a decade ago, I noticed that people were focusing on the old-chestnut encores, which are beautiful and catching, but I wasn’t sure where the newly written encore pieces were. I wanted to create a project that could bring together many different styles of encores, all written on commission at around the same time by composers around the world. It took a while to figure out where to start with this idea, but eventually, I realized the initiative had to come from me so I began by listening to lots of music and asking people for suggestions. In the end, I wound up letting my reaction to what I heard be my barometer. If a piece of music spoke to me in some way, and it felt right for the project, I asked that composer to write an encore. Of course, I probably missed a lot of great writers and at another point in time, I could have wound up with a different group of composers, but I am really happy with the people involved and the work they are doing. It feels right. The span is comprehensive, too, which is rewarding to see. ELM: What else should listeners know about Encore? HH: Just to enjoy what they hear and have fun discovering different composers! ELM: I understand the 27th composer whose work you will feature will be determined by a contest, which I’ll link my readers to. [Note: that announcement is here .] Can you give any hints as to what would really knock your socks off? HH: I am looking forward to seeing what comes in. I’m not looking for anything in particular, beyond music that speaks to me in some way. That is how I approached the other 26, in finding the composers who eventually would comprise the commissioned group: I listened to a lot of music with encores in mind, and certain writers jumped out at me. Also, from the get-go, it was important to me that the composers have complete artistic freedom. I asked only for a piece between 1.5-5 minutes long, for acoustic violin and piano. I feel that if people are trying to write a certain kind of piece in order to win the contest, it will represent only a shadow of their own creativity. Composers should be free to write what comes to them. That’s why I’m not specifying anything in particular by way of artistic guidelines. If it’s meant to be, the pieces will fall into place, so to speak. ELM: Your publicist referred to “the insanely complicated process of writing a new work in the classical music world.” For those of us not in the classical music world, what is so complicated about the process? HH: I am not sure which context that quote was drawn from, but the complications are a motley set of logistical challenges. Finding performers to play your music, locating and securing funding for commissions, organizing performances, making sure your music is written in such a way that it can be fairly represented by different musicians throughout future history, ensuring that a new piece is played beyond the premiere, getting word out, connecting with the audience through the music, giving musicians the freedom to interpret your music in a way that will do it justice while still staying true to your original intent, etc. None of these have formulaic solutions. Each element are tricky to nail down, and coordinating all of them is daunting. ELM: Do you consciously try to cultivate a younger audience for classical music, or does it just happen as you lead by example? HH: That is a theme that has come up over and over again in my awareness since I went to conservatory at 10, so I have grown up with this idea that classical music needs to constantly “find” our new audience or our work will die out. While there may be something to that, as it probably applies to most fields of work around the world, in all different industries, it is important to make sure that artists have the space to pursue their interests and strengths without the pressure of utter system failure. I have actually not made a conscious effort to cultivate one type of audience over another; I find variety in an audience — from first-time concertgoers to lifelong enthusiasts — to be enriching and the best testament to any art form’s contributions. I have, however, made a big effort to stay true to myself. I have a lot of interests, so I feel very fortunate that I can incorporate those into my professional life: I am busy, but I get to do my hobbies too! These just happen to dovetail with a certain core audience’s interests. As an artist, there is little difference between finding your audience and your audience finding you, but that doesn’t happen in a long-term way unless you are in your artistic element and able to express yourself in a way that is natural and sustainable for you. Some of us like to write, some of us are historians, some of us found music programs in schools — with everyone adding his or her corner of specialties, we wind up with a diverse musical world, with something in it for every person who is interested. That is fascinating to me. In other words, in order to have something to offer, we first have to take care to build the substance so there is something to talk about into the future. HH: Quite a list. Anne Tyler, Dostoyevsky, Colum McCann, Kiran Desai, Jane Austen, Fitzgerald, John Steinbeck, etc. I can’t even think of everyone off the top of my head!